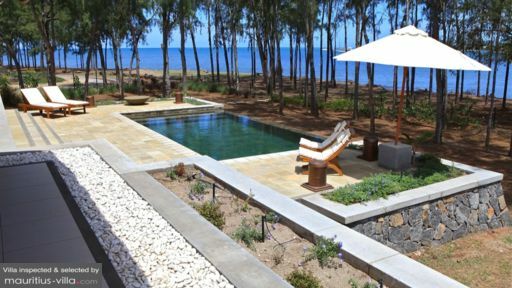 Situated in a private estate on the south western coast of Mauritius is Villa Salines Seaview, a four bedroom tropical paradise. With gorgeous natural surroundings, comfortable bedrooms, and an open plan living space, you can relax and unwind here. The expansive calming spaces are also a good place for you, your family, and friends to reconnect and enjoy each other’s company. Imagine sleeping in peace on a plush bed. The master bedroom of Villa Salines Seaview is equipped with a ceiling fan, air conditioning, tasteful wooden furnishings, and decoration. You can bathe in privacy in the villa’s en suite bathroom. In the mornings, you can stretch and have your cup of coffee on the sea-facing verandah. Here at Villa Salines Seaview, there are three relaxing guest bedrooms in which you are sure to get a good night’s sleep in. Two of these bedrooms have en suite bathrooms for a private bathing experience. The second bedroom has a double bed and also a beautiful view of the sea. The third bedroom has a comfortable queen size bed while the fourth one has two single beds. Amidst rolling hills, calming waters, and a lush green garden landscape is Villa Salines Seaview. Feel like you’re on a quiet retreat here at the villa, away from the concrete and noise of city life. Have a refreshing swim in the villa’s private pool. You can do some morning laps or float on your back and enjoy the view of the blue sky above. 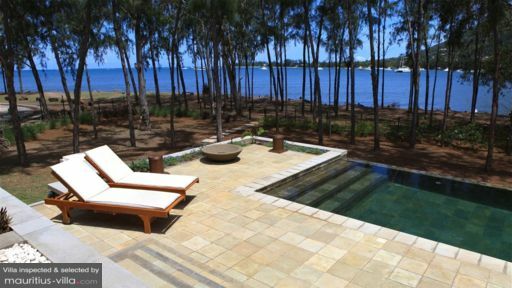 On the expansive veranda, you can gaze at the sunset while laying back on one of the sun loungers or deck chairs. In the evenings, enjoy a romantic candlelight dinner in the outdoor living and dining area. You can also cook some barbecue as the space also comes with a portable barbecue set. There is no place like home but Villa Salines Seaview’s living space comes close. With beautiful wooden furnishings, open plan living design, and a stunning view of the horizon from the sliding doors, you’ll relax into this space in no time. The lounge area has plush sofas perfect for laying back while watching TV. In the evenings, this is also a good place for a family movie night as the space comes with a DVD player. Aside from the lounge, the villa also has a kitchen and dining area. The dining area can comfortably seat six to eight people. The kitchen is fully equipped, you will not have trouble finding the things you need to create a good meal for you and your family. The staff here at Villa Salines Seaview are friendly and accommodating. Here, you’ll feel pampered and well taken care of. Upon arrival, guests will receive a welcome pack. There is 24 hour security that will make sure you feel safe and comfortable.Housekeeping will ensure that the space remains tidy during the duration of your stay. There are also a number of other services that can be availed of for additional costs. 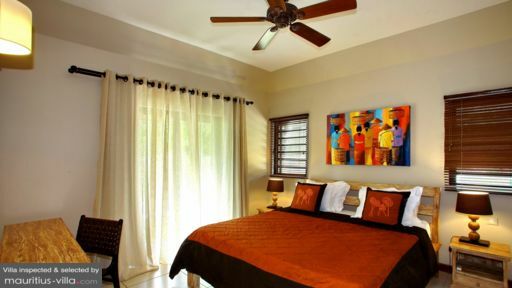 Villa Salines Seaview is located on the Riviere Noire on its south western coast. It is situated in a space conducive for relaxation because of the enchanting sea view. There are also a number of activities within the area that make the villa a prime spot for fun outdoor activities. The Le Paradis Golf Course and Tamarina Golf Estate are a 15 minute drive away. There are also a number of cruises that you can inquire about and avail of. For those who enjoy fishing, the Le Morne Anglers Club is a 5 minute drive away. For those who enjoy diving, there are a few dive sites within 20 minutes of the villa. Whatever you fancy is, Villa Salines Seaview offers guests lots of opportunities to enjoy and experience the island’s natural surroundings.